DII "SNOWFLAKE NAPKIN SET ~ SET OF 4" ~ 100% Cotton ~ NEW! 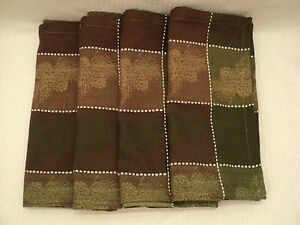 DII "GREEN NAPKIN SET ~ SET OF 4" ~ 100% Cotton ~ NEW! DII "GREEN RIBBED PLACEMATS" ~ SET OF 4 ~ 100% Cotton ~ NEW! DII "SNOWFLAKE OVEN MITT AND TOWEL SET" ~ SET OF 6 ~ 100% Cotton ~ NEW! Details about DII "PINECONE NAPKIN SET ~ SET OF 4" ~ 100% Cotton ~ NEW! DII "PINECONE NAPKIN SET ~ SET OF 4" ~ 100% Cotton ~ NEW!